In the last 10 years, dozens (hundreds?) of colleges and universities have added courses related to environmental and social sustainability. While we love many of them (and have contributed to more than a couple, including an awesome 3-course certificate in Sustainability Innovation from the University of Vermont, the big game-changer has been the launch of Coursera. 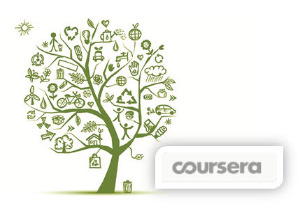 Here are nine free Coursera classes on sustainability topics that have caught our eye. Check them out, and leave us a comment about any that we've missed! Coursera currently offers more than 300 courses (with thousands of students taking each class) -- the lectures are recorded, with videos, articles, homework, and discussion boards to enrich the learning experience. SSC President Jennifer Woofter took the course on Gamification, and was able to apply the concepts to her sustainability work -- so we're sure that there are lots of ways to use Coursera to advance your sustainability practice. Leave a comment, or join the conversation on Twitter (@jenniferwoofter) and tell us how you're using Coursera!